THOSE LAZY CRAZZY HAZZY DAZS OF SUMMER ARE HERE - IT'S THE MOST WONDERFUL TIME OF THE YEAR. 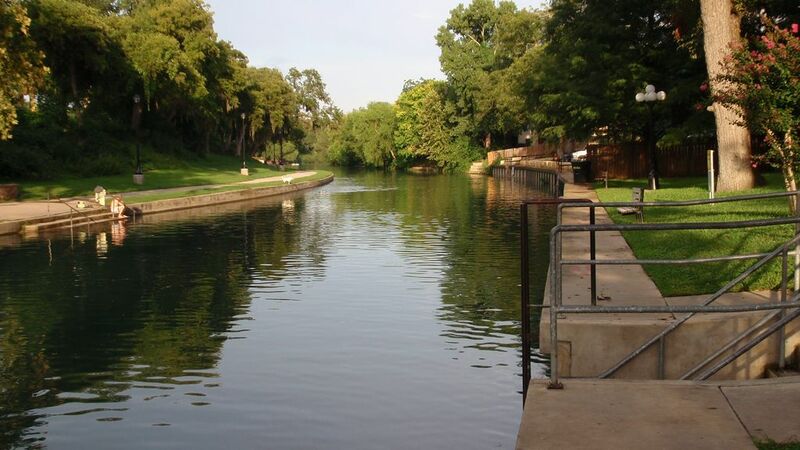 ENJOY THE RIVER AND SUMMERTIME IN NEW BRAUNFELS!! GET 'EM WHILE THE'RE HOT! 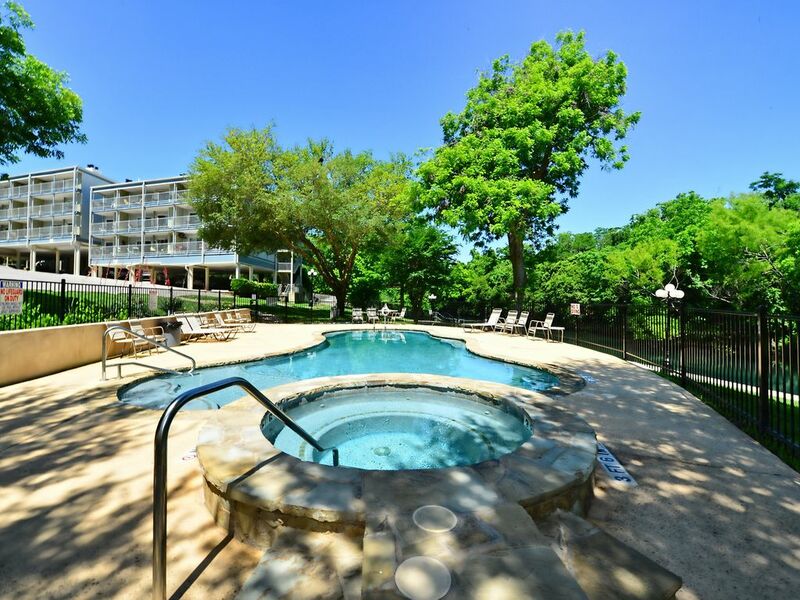 The COOL COMAL COTTAGE is a beautiful third floor condo with a stunning view of beautiful New Braunfels. 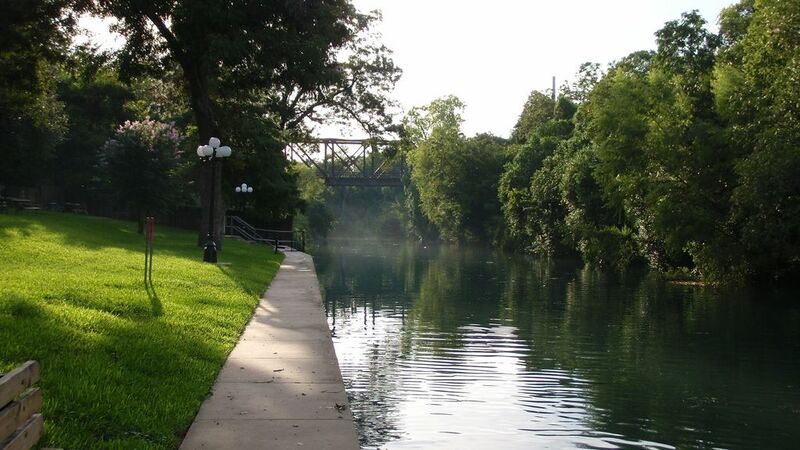 The Comal River is known as “the shortest river in Texas”. This two mile river is crystal clear and a constant 68 degrees year round. 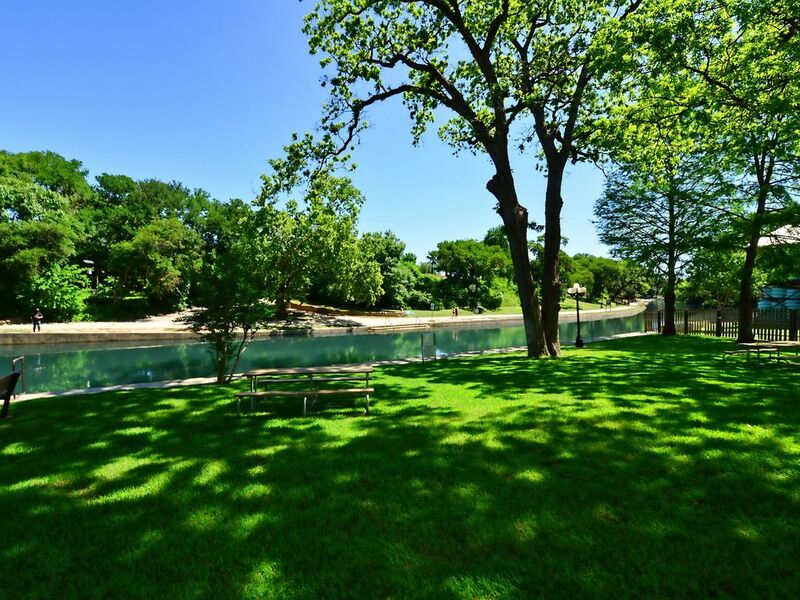 The COTTAGE has an ideal location on the river. 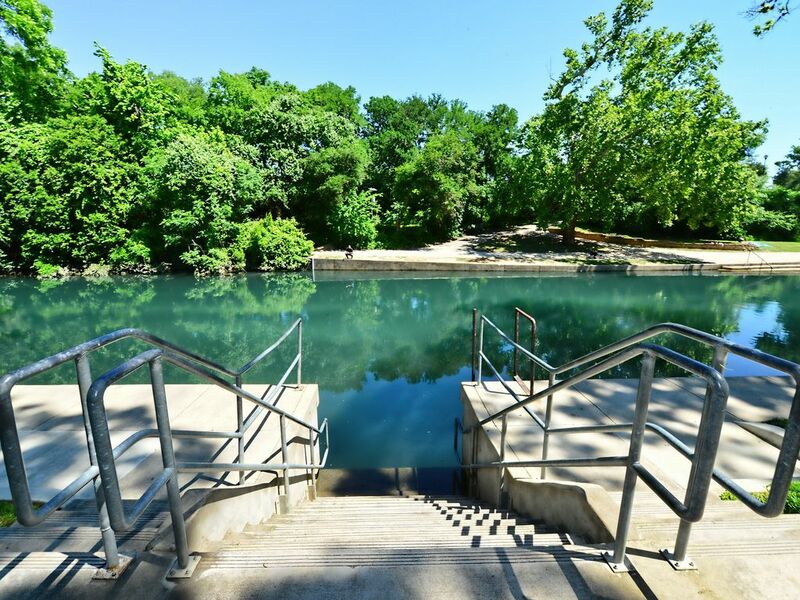 It is close to the headwaters and allows for one of the longest floats on the Comal River. 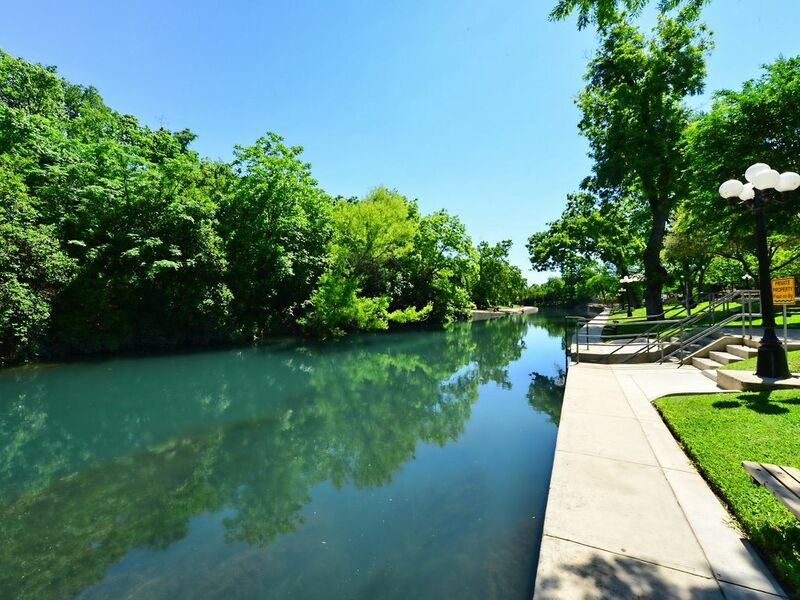 The river area next to the condo also offers one of the best areas for swimming and splashing in the clean refreshing waters. 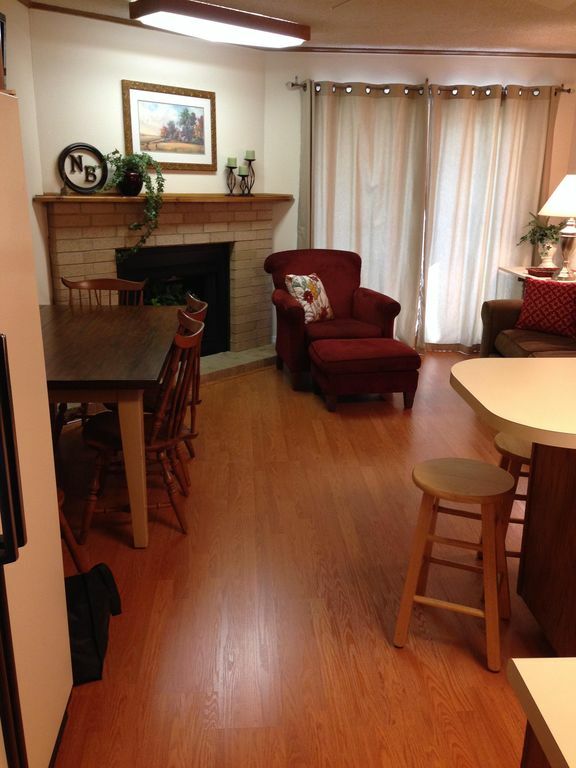 Inside the COTTAGE you will be treated to traditional TEXAS COTTAGE living. Our objective is to provide a cool, light and airy environment with natural “green” products while affording you to the comforts of modern sophistication. At the entry you will be greeted by natural wood floors that extend from the door all the way across the condo through the living area and to the balcony on the other side. 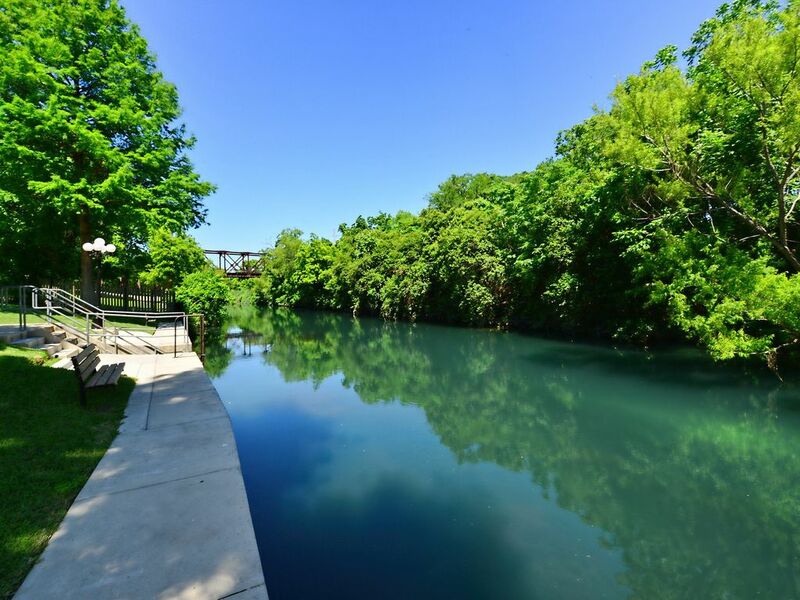 The beautiful warm tones of the condo stand in contrast to the cool colors that come from the refreshing waters of the COMAL river, the calming blues of the sky and the lively greens of the spring budding leaves. The bedrooms are simple but elegant and each room is equipped with a television with over 100 cable channels. We also have wonderfully large flat screen with DVD player in the living room and a library of videos for you to choose from. 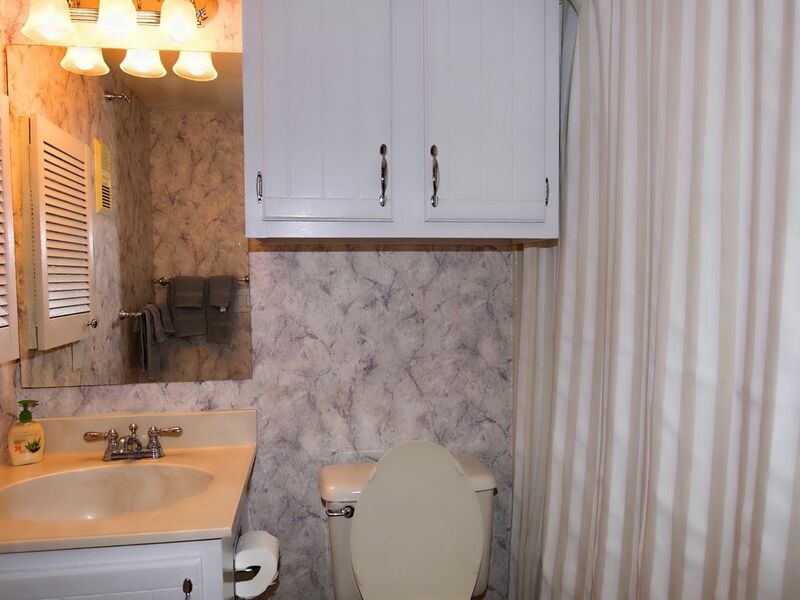 The bathrooms will make you feel right at home with their comfortable cottage style. 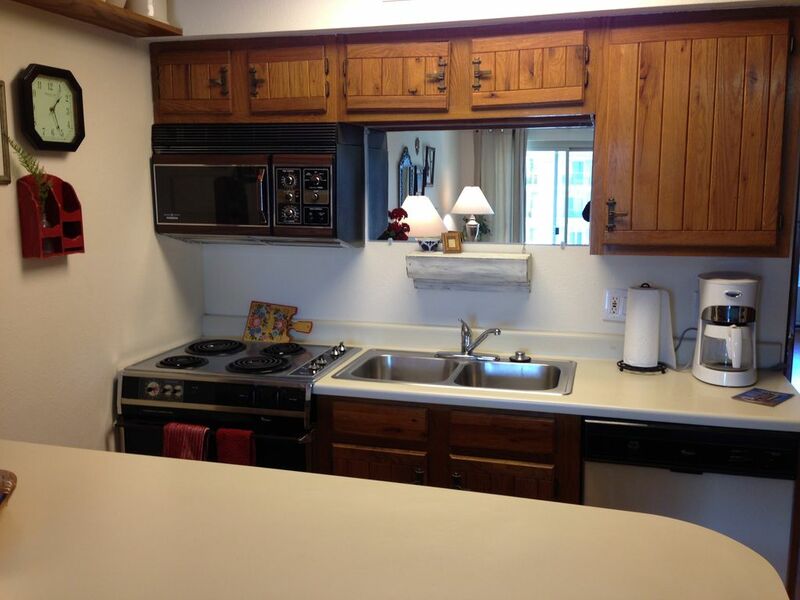 The kitchen will invite the entire family to gather around with its tasteful simplicity and COOL COTTAGE style. 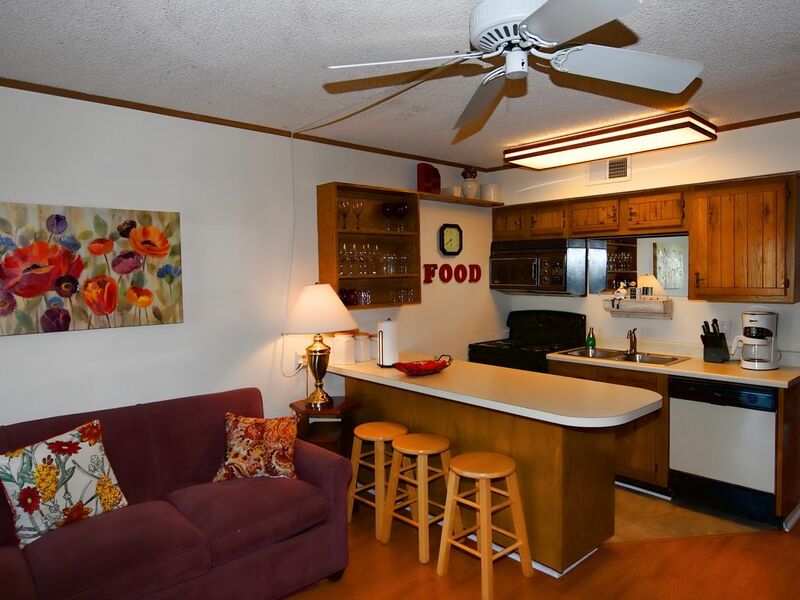 The kitchen is open to the living area which is furnished with a nice sleeper sofa, a comfy arm chair and a big screen TV. Oh and did we mention the view from the balcony? What a perfect transition it provides from the beauty inside to the beauty outside. Take time to “set a spell” and enjoy the comfortable chairs and beautiful mosaic table. Our condo complex has recently completed a multi-million dollar renovation of the exterior. 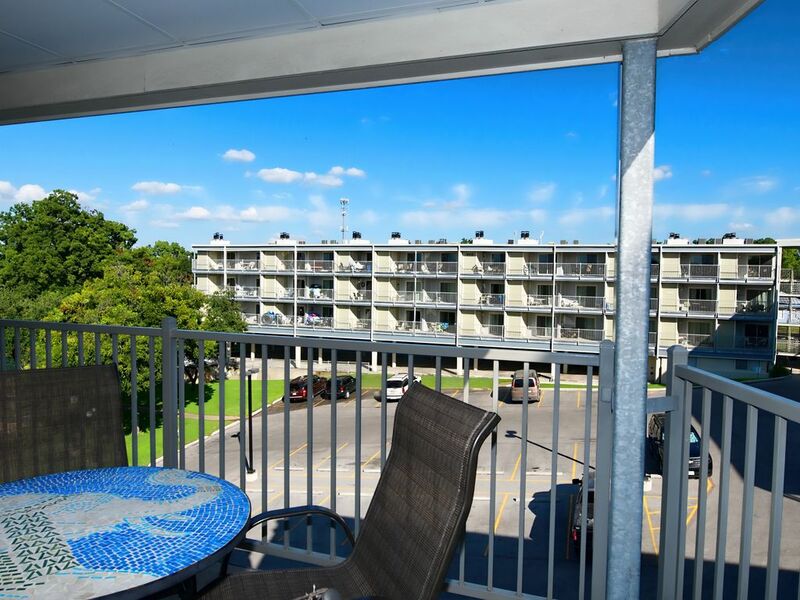 All the outside walkways and balconies are brand new and waiting for you to enjoy them. 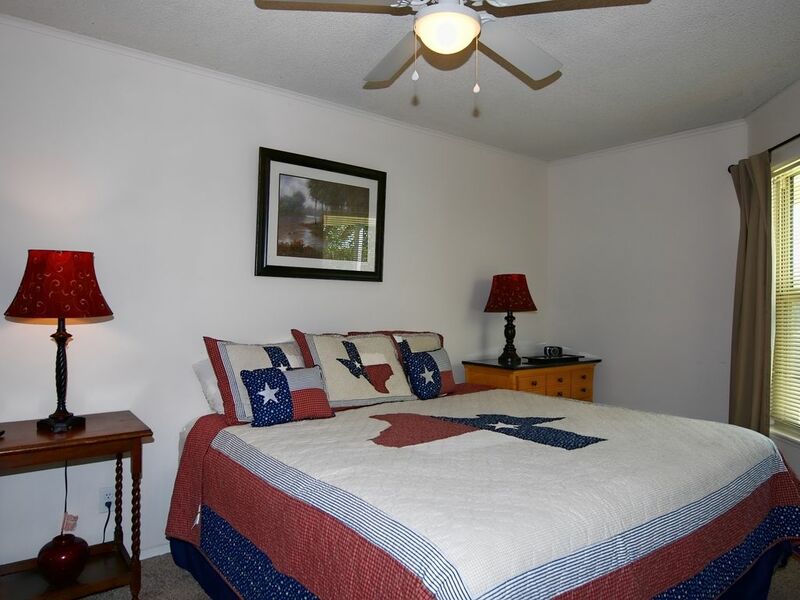 We certainly hope that you will choose our COOL COTTAGE in paradise when you plan your vacation to New Braunfels. We have done what we can to make it a wonderful experience for you. 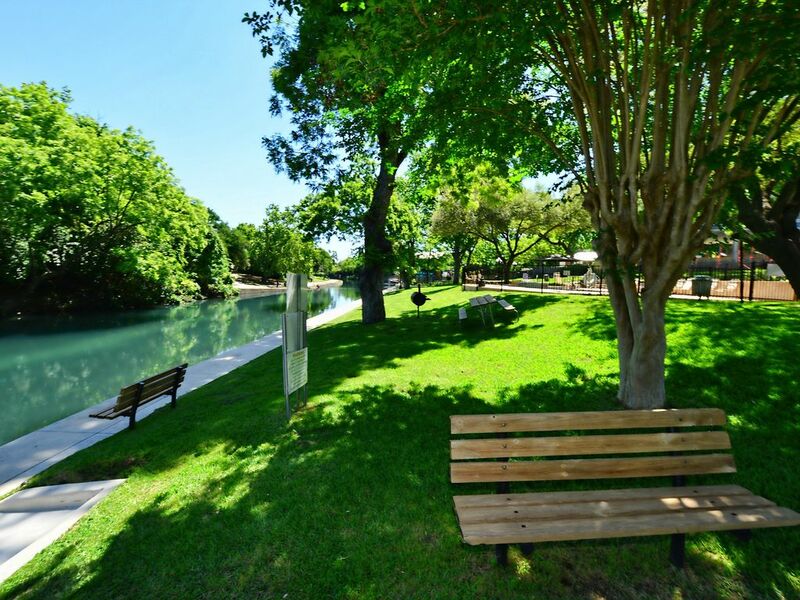 The COTTAGE is also located near the Schlitterbahn Water Park, a 65-acre mega complex, voted America's #1 Water Park for the past six years! 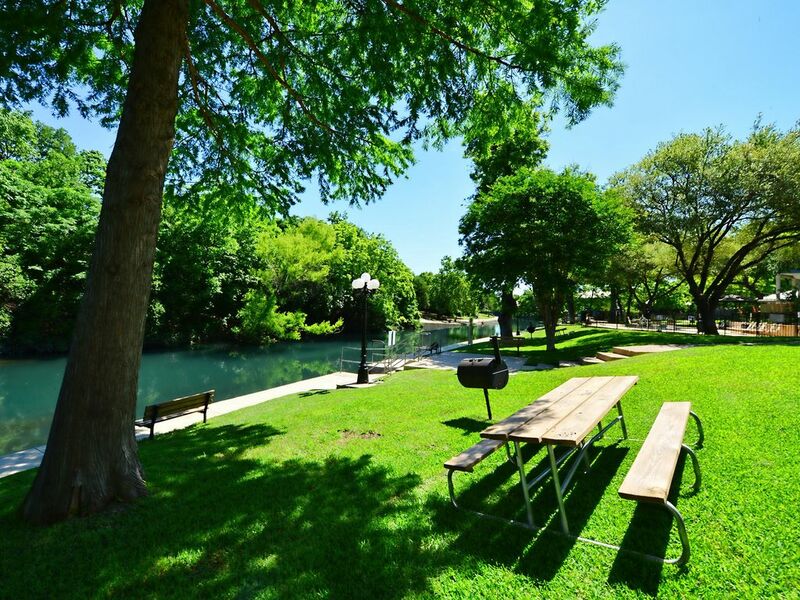 COOL COMAL COTTAGE is within walking distance of downtown New Braunfels--and only five blocks from the 100-year-old Naeglin's Bakery! 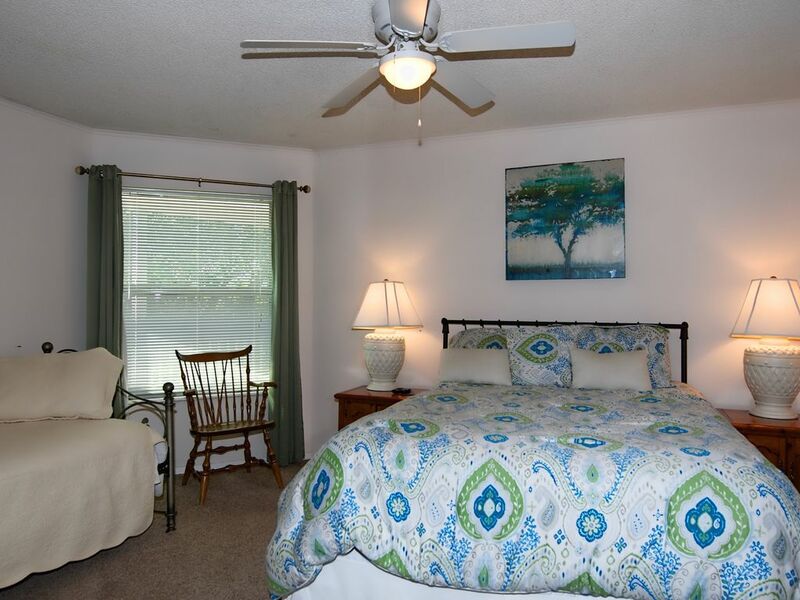 Inside, this attractively decorated two-bedroom two-bath condominium comfortably sleeps six adults. You can squeeze 8 in if some are children. Master bedroom (queen-size).Day bed in master (twin size), Front bedroom (full-size). Sleeper couch (full-size). Our stay at the Cool Comal Cottage was wonderful. The location is fantastic and it's a great SAFE place for the kids. The owner was in constant communication with us at all times. We had to purchase tubes during our stay (to replace some that would not hold air) and the owner reimbursed us very quickly. 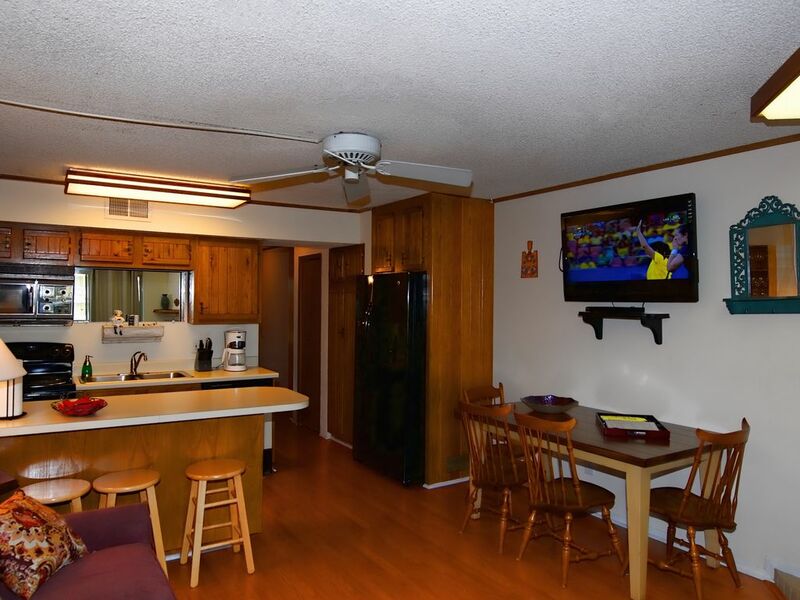 The condo was very clean and has everything you need for a comfortable stay. I would recommend bringing a fan for the living room area because it tends to stay warmer than the rest of the condo. There is only one air vent in the kitchen and with the door to the balcony being opened frequently, it tends to stay warmer in that area. This is a 5 star review for the room, location , and awesome owner of this particular condo; however, we were very disappointed in the management monitoring the gate. They were extremely rude and unprofessional. River Run will not let anyone on the premises that does not have a wristband, regardless of the relationship (example: our kiddos grandparents). While we admire that the rules are being followed (which is the reason this is such a great safe place for the kids) they were very rude and attempted to get the owner involved when he had nothing to do with it. We watched them get into several arguments throughout our stay with multiple attendants. I wanted to add this to the review so that the owners of the condos at this property are aware how the management is treating your customers. Overall, a very very GREAT vacation and stay at the Cool Comal Cottage. We loved our stay at your condo. Very clean!! 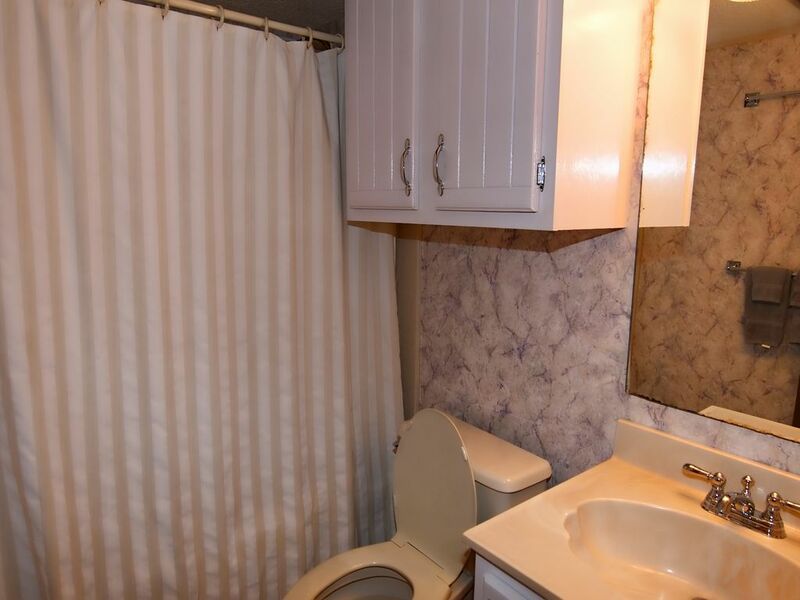 plenty of dishes, towels and bedding. Grill area and pool are very clean. 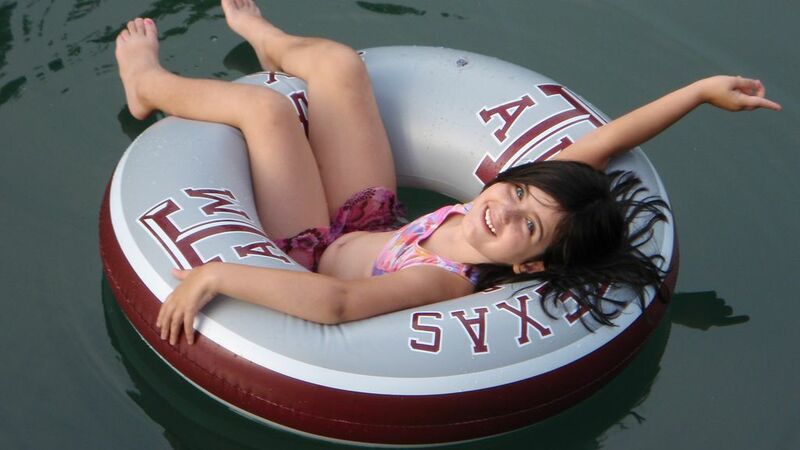 If you like to float but do not want to all day the location is perfect. Float an hour to the chutes then a sort walk back to go agian. You can arrange a ride back if you want to go all day. This condo had 8 floats and the tool for us to blow them up with. HUGE SAVINGS. The security officer made sure all non visitors were asked to leave. We had four extra wrist bands for our friends staying at another place but came over to cookout. If you plan to do this I would ask for more bands as we were short 1 for a child. The water is AMAZING!!! 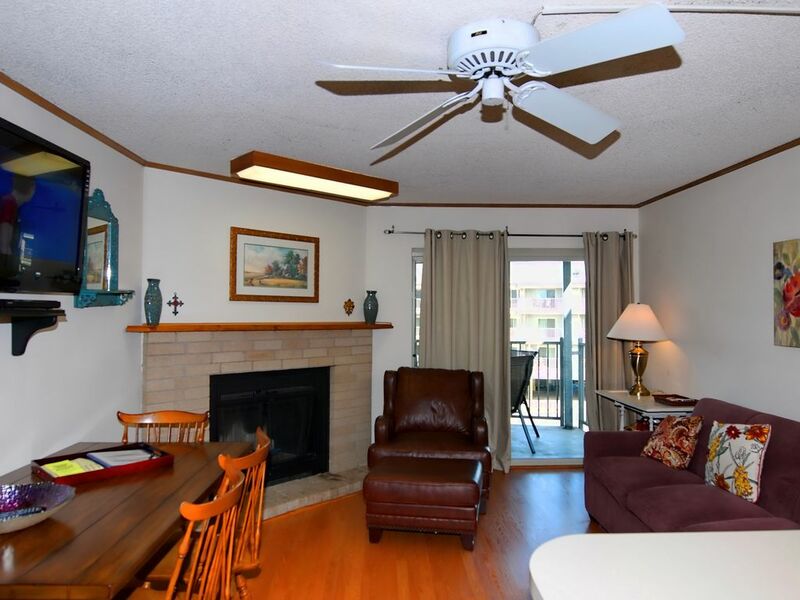 The condo was in a great location: afternoon shade on patio, top floor corner unit. We traveled with 5 kids and 3 adults, and there were plenty of beds/space for everyone. The bedrooms were quiet (could not hear noise from other patios; although no one was loud...even on 4th of July!). The condo was clean and comfortable, with lots of seating in the living room. The owner thought of everything: enough high-quality river tubes (saved us $15 per person!!) and recommendation for an inexpensive tubing shuttle. 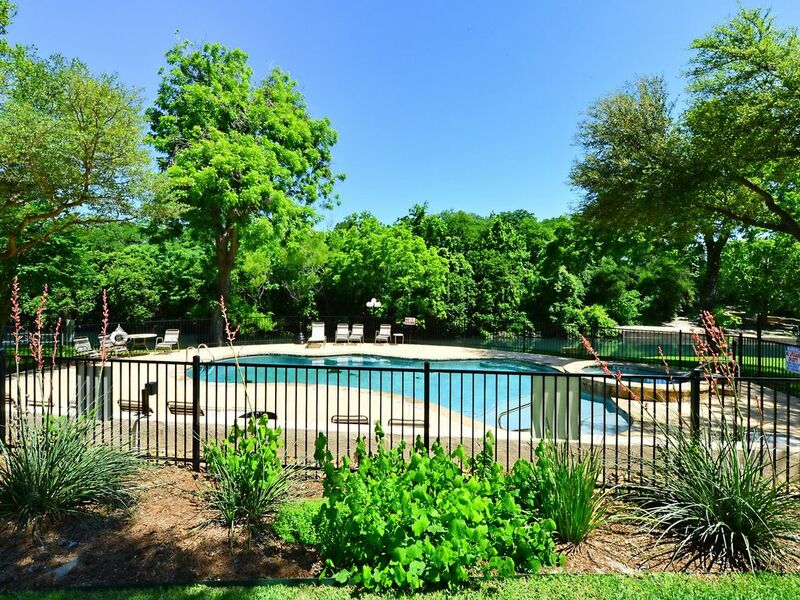 All of the patios face inward toward the complex and parking lot, and there is a great view of the pool and river. We were able to watch 4th of July fireworks from the beside the pool (partially-obstructed view, but still great!). Easy access to the river with steps and ladder for the kids. 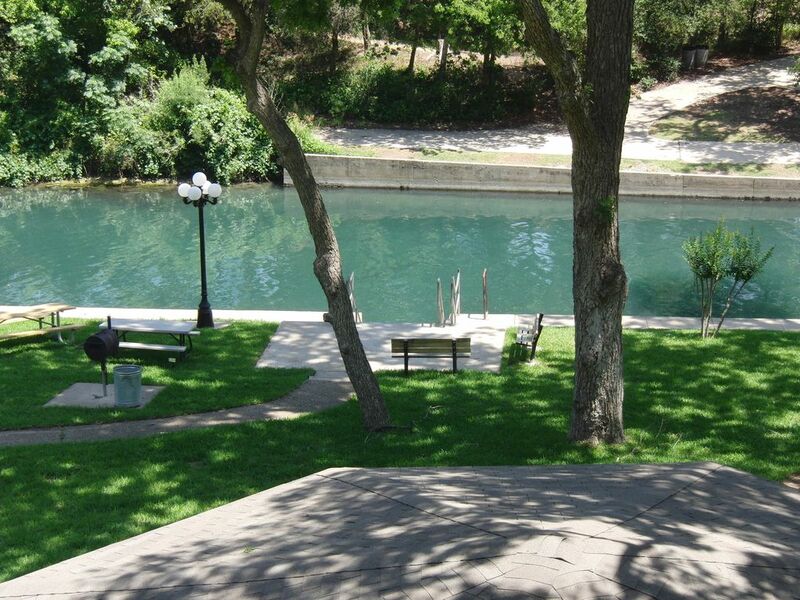 This condo was a wonderful place to stay on the Comal River. It was really clean. Had all the things that you need for your stay and had comfortable beds to sleep 6 of us. The owner provided us with all the information you would need to know for floating down the river including maps. He also provides tubes for you so you do not have to rent them. The location was also great because you can walk to town. 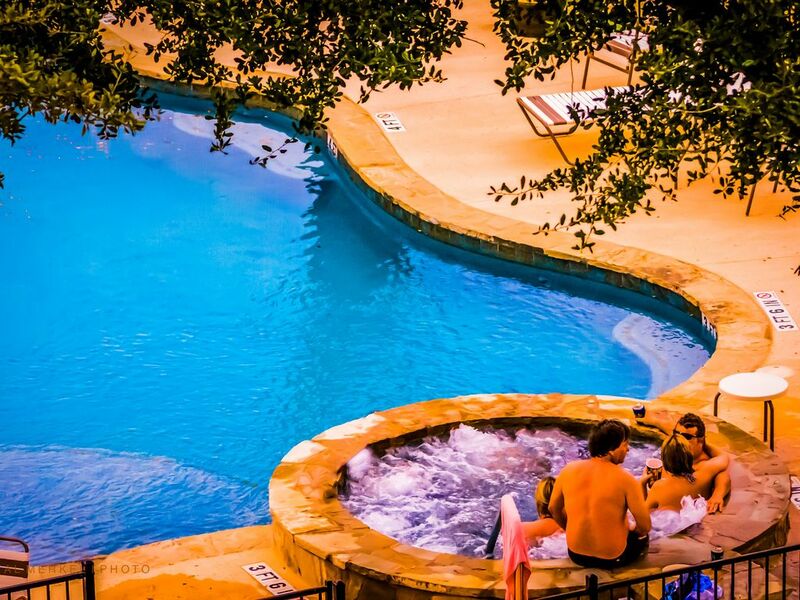 Also the pool and hot tub was also great for relaxing after tubing all day. I would highly recommend this place and I can't wait until we can return for another visit. 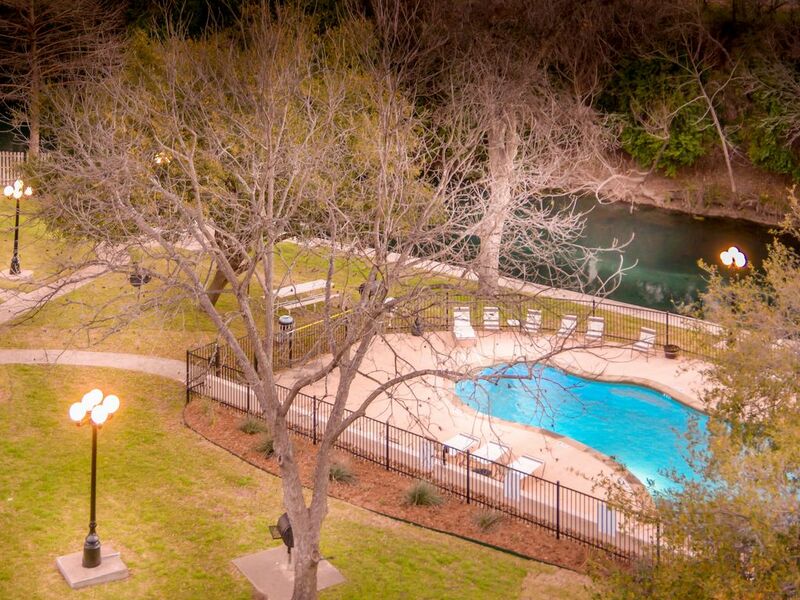 We loved the condo, nice pool area with bbq pits, right on the river. Location was ideal, away from the main crowd so we could enjoy our family time. Would recommend this place to anyone who asks.